CNG: eAuction 438. MOESIA & THRACE. Æ Dupondius (34mm, 25.52 g). Countermark applied under the Flavians, AD 69-81 . 438, Lot: 340. Estimate $100. Sold for $180. This amount does not include the buyer’s fee. MOESIA & THRACE. Æ Dupondius (34mm, 25.52 g). Countermark applied under the Flavians, AD 69-81 . 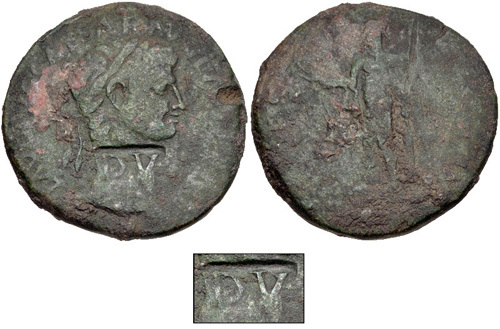 DV in rectangular countermark on an imitative bronze sestertius of Claudius. Pangerl 85. Host Fine, c/m Near VF, green and red-brown patina, some roughness. From the Richard Baker Collection, purchased from Plamen Arsoff, 1997.